The plan proposes to build an extensive road network of 16 new regional expressways running across 1,300km. The proposed expressways will be built in such a way that they can be extended further. For example, the proposed Delhi- Meerut Expressway can be extended to other parts of NCR. Also, a Regional Rapid Transit System (RRTS) has been proposed. RRTS is a rail-based mass transit system, which will connect far-flung areas of the NCR to the central parts of the NCR (Delhi, Meerut, Gurgaon, Noida, Ghaziabad, Faridabad, etc). RRTS will have dedicated rail lines and will provide fast and frequent train services. Ram Gopal Gupta, a policy and city planner, says: "According to the plan, five urban clusters in the NCR, Gurgaon-Manesar, Faridabad-Ballabgarh, Meerut, Ghaziabad and Noida-Greater Noida-Kasna would become mega cities by 2032. The plan proposes to set up an NCR Expressway Development Authority, besides spending Rs 26,000 crore to augment the capacities of the existing national and state highways. The plan also suggests setting up wayside amenities at a cost of Rs 110 crore." According to a report, nearly 6,200 buses of different state transport services cater to intercity travel. By the next two decades, the number of buses required will jump to 37,000.The plan hopes to augment bus fleets and set up depots at an estimated cost of Rs 25,873 crore. Of this, 75% has been proposed to be raised through public-private-partnership model. Bus terminals will also be set up at a cost of Rs 3,539 crore. According the NCR Planning Board, eight new lines have been proposed to link areas like Bahadurgarh-Rohtak, Kundli-Sonipat, Sonipat-Panipat, Ghaziabad-Hapur, Ghaziabad- Meerut, Manesar-Rewari, Gurgaon- Manesar, and Faridabad- Palwal. The existing lines originating from Delhi will be extended. It will cover a total length of 534km at a cost of Rs 36,000 crore and will ferry 10.2 lakh passengers a day. The plan backs the Uttar Pradesh government's move to set up an airport at Greater Noida. The terminal is expected to cater to 40 lakh passengers a year. The study says an NCR transport development fund should be created to raise resources. Funds can be raised through the state and central budgets by levying user charges, generating advertising revenue, betterment levy, and commercial exploitation of bus depots, terminals, and through market borrowings. Though the board has approved the plan, it is to be seen if the respective state governments will stick to the deadline. Several reports show that the five national highways (NH-1, NH-2, NH-8, NH-10 and NH-24) converging onto the ring roads of Delhi are holding up the smooth passage of passenger and goods vehicles, for hours. In order to avoid this congestion, linkages have been proposed for the five national highways outside the dense built-up areas of Delhi. The Regional Plan-2021 for the National Capital Region of Delhi envisages development of peripheral expressways to act as the third ring road for Delhi. 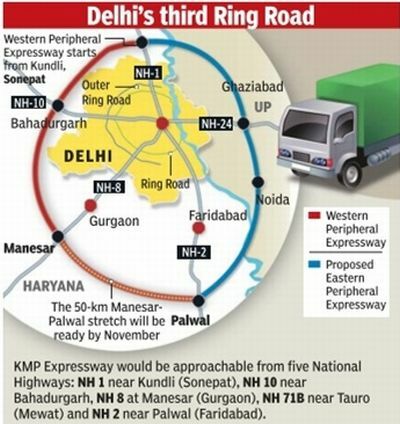 Western Peripheral Expressway: The western half of the Peripheral Expressway Ring linking NH-1 at Kundli in the North to NH-2 at Faridabad, Palwal in the South via NH-10 and NH-8 (Manesar) along the western periphery of Delhi has been designated as the Western Peripheral Expressway, widely referred as Kundli-Manesar-Palwal Expressway. This expressway, with 4-6 lane access-controlled configuration, offers access to the international airport in the capital, and facilitates the development of a new economic corridor. Kundli-Manesar-Palwal expressway: This 135kmlong Kundli-Manesar-Palwal Expressway project is being developed by Haryana State Industrial and Infrastructure Development Corporation (HSIIDC) through a special purpose vehicle (SPV), KMP Expressways, comprising DS Constructions, Apollo Enterprises, UK, and Madhucon Projects. HSIIDC and KMP Expressways have signed an agreement where the cost of the project has been estimated at Rs 1,915 crore (includes Rs 630 crore as cost of land acquisition). The concession period is for 23 years and 9 months. Eastern Peripheral Expressway: The other half of the Peripheral Expressway Ring includes connectivity between NH-1 (at Kundli) and NH-2 (near south of Faridabad, Sikri) through Ghaziabad and Noida on the eastern side of NCR – it is called the Eastern Peripheral Expressway. Extending over 105km, the preliminary feasibility study for the total project is estimated at Rs 368 crore. It involves two links as Faridabad-Noida-Ghaziabad (FNG) Expressway corridor (56km) and Ghaziabad-Kundli (GK) Expressway corridor (49km). Detailed feasibility studies have been done for both the links of the Eastern Peripheral Expressway with assistance from Asian Development Bank (ADB) and Japan International Corporation Agency (JICA). The Eastern Peripheral Expressway is being executed by the National Highways Authority of India. The orbital train alignment along KMP (Kundli,Manesar-Palwal) Expressway and EPE (Eastern Peripheral Expressway) is being re-worked. 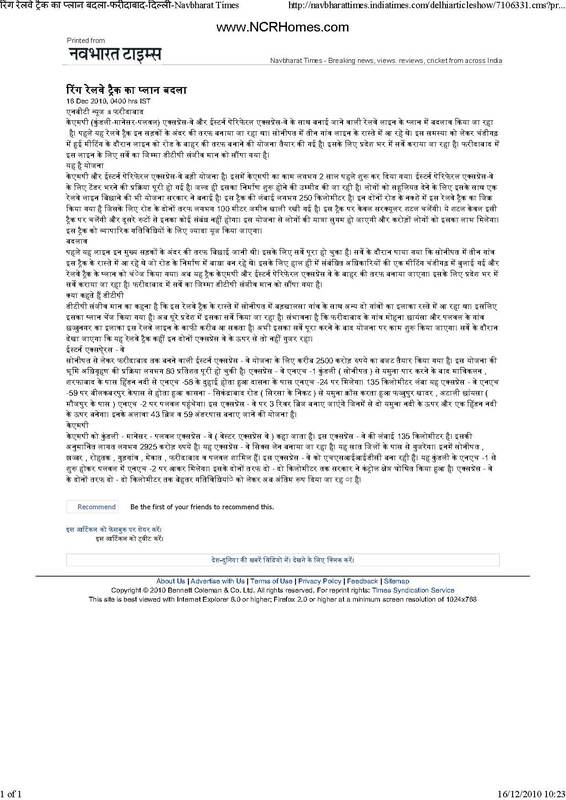 This is being done to avoid orig alignment going thru abaadi areas of 3 villages in Sonepat. Previously the orbital train's alignment was within the ring formed by KMP & EPE which is being re-worked now to align it outside the ring of the upcoming KMP/EPE expressways. Please refer attached image for more info on these orbital/ring trains and some info on KMP & EPE.